There are quite a few small car choices available to drivers looking for a used car around Mechanicstown, but we think a used Honda Fit probably fits most of your needs, if you’ll pardon the pun. We have plenty of new and used Fits at Middletown Honda, and there is one thing we have found in common among their drivers: a sense of affordability and practicality. The Fit is a great small hatchback with a solid fuel economy and plenty of room, and it has been since it debuted in 2007. Let’s look at what you could have to choose from when you look for a used Fit at Middletown Honda. Many drivers opted for the Sport trim level, which added on 16-inch alloy wheels, a rear spoiler, leather-wrapped steering wheel, a six-speaker sound system, and an optional navigation interface. The 1.5L four-cylinder under the hood ensures you’ll have little trouble getting up to speed when you need it, too. Earlier models have featured similar equipment options, and you would do well to drive home any second generation Fit. As long as they have fewer than 80,000 miles on them, all of this generation is eligible for Honda’s Certified Pre-Owned program, offering the comfort of a 150-point inspection and new warranty coverage. 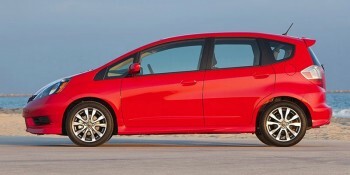 The first batch of Honda Fits weren’t around for long, but they made a lasting impression. Roomier and more versatile than competing vehicles, the Fit distinguished itself quickly, particularly with its handy rear seats, which could be configured in four different ways to maximize storage room for cargo and passengers. Not only is the Fit fun to drive, with good handling and cornering, but it started out affordable, which means that finding a used first-gen Fit will bring to you a great driving experience with even greater savings. Like the second-gen model, this one also comes with a 1.5L four-cylinder engine. Contact our sales experts today to ask how you can get behind the wheel of a gently used Honda Fit. You should check out our used car inventory in person at Middletown Honda; we’re just a quick trip over from Mechanicstown and feature one of the best used car selections around. Come see for yourself at 520 Route 211 in Middletown.